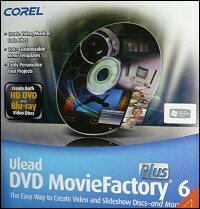 I did not realize at the time I agreed to review Ulead's DVD MovieFactory 6 Plus program (http://www.ulead.com/dmf/runme.htm) just how complex a task it would be. I figured software that states it is "easy-to-use disc authoring and burning software for today's digital lifestyle" would be a perfect candidate to try out on my new Vista Home Premium computer. I quickly found out that DVD MovieFactory is just not one program but a group of programs loosely connected by the DVD MovieFactory Launcher which attempts to point you in the right direction for whatever you want to do. There are so many aspects and features in this software suite that any review can only touch on a few. Ulead is now part of Corel. Corel completed its acquisition of Ulead (and InterVideo) last December. Corel is a name we have known for years as a provider of excellent professional software, so this is a large software package. Minimum requirements are an Intel Pentium IV 1.8 MHz or AMD Athlon XP 1800+, 512 MB RAM (1 GB or above recommended) and Windows XP or Vista. Approximately 900 MB of hard disk free space is required for program installation. Since I have a AMD Athlon 64 X2 4200+ Dual Core 2.2 GHz processor, 1 GB of RAM, and Vista Home Premium I figured I met the requirements. The package comes with two CDs and a printed manual. The main CD is 593 MB and installs all of the following programs: BD DiscRecorder 2.7, Burn.Now 4.5, DVD DiscRecorder 2.3, DVD MovieFactory 6 Launcher, DVD MovieFactory 6, QuickDrop 2.0, Windows Media Encoder 9.00 with it's Utilities (File Editor, Profile Editor, and Stream Editor), and Apple's QuickTime 7 Player and Picture Viewer. The second CD is a 370 MB bonus software disc which contains InterVideo's WinDVD Player 8.0 Silver and DVD Copy 5.0 Silver. For purposes of this review I'll skip further mention of the Bonus CD. When installing large programs I wish the software companies would give you a step-by-step walk through of what to expect during installation. Such was not the case with DVD MovieFactory. I was flying blind. After clicking "Install" the Install Shield came up and immediately told me it needed to install Microsoft DirectX Feb 2006 Runtime and Microsoft Visual C++2005 Redistributable Package (x86). It said these were required, so all I could do was click "OK." After going through the usual License Agreement, customer info screens, and selecting various default settings the files copied, installed, and configured. I then had to do an auto reboot for the installation to finish. Upon Vista's reboot I got a strange small message window on a black screen that said "1670:" with an "OK" button. That's the kind of surprises I hate! What was I to make of that? What did it mean? Was it Vista or was it DVD MovieFactory that had caused this message? I have no idea. All I could do is pray and click "OK." Well Vista booted fine and I have not seen that message since. When all was said and done installation had taken almost 30 minutes and I had all those programs listed above on my hard drive. At no time was I given a choice to not install something (for example Apple's Quicktime). It was all or nothing. I mentioned that DVD MovieFactory comes with a printed manual. That may sound like a bonus because much software now-a-days comes with no printed manual. However, many of us senior citizens might need a magnifying glass as the manual is a "whopping" 4.5 inches by 6 inches in size with small print. DVD MovieFactory does include the manual as five PDF files on the CD and they also get put on your hard drive during the program installation. Below is a brief overview of the six main programs. Then I'll get into some of my testing to try and give a clearer picture of all that DVD MovieFactory can do. BD DiscRecorder allows users to capture, edit, and save videos in the BDAV (Blu-ray Disc Audio-Visual) format for use with Blu-ray discs. I did not test this program as it pertains to the Blu-ray High Definition video format. I have not yet graduated to this state-of-the-art technology. DVD DiscRecorder allows users to capture, edit, and save videos in the DVD-VR format or convert these videos to the DVD-Video format for use with DVD-RW or DVD-RAM discs. The DVD-VR (Video Recording) format is used with DVD camcorders and set-top DVD recorders. Burn.Now is described as an easy-to-use burning tool. Decide what kind of discs you want to use, and what you want to burn on them. Burn.Now allows users to burn files and projects to CDs, DVDs, BDs, and HD-DVDs.You can write to BD (Blu-ray Disc) and HD DVD (High Density Digital Versatile Disc) discs. You can create and edit Data discs, Secured Data discs, and MP3 discs. You can create Audio discs, DivX discs, and Bootable discs. You also can copy discs directly including movies (if not copyrighted) or make disc images. Burn.Now also includes tools for formatting, erasing, and closing a disc. QuickDrop is a program that provides a quick "drag & drop" way to directly burn a variety of discs (data, audio, video) as well as play and edit media. Here the emphasis is on saving time and effort. 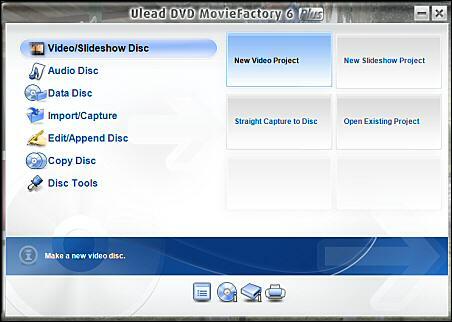 DVD MovieFactory is the host program for authoring and editing tasks in creating video/slideshow discs complete with professional looking menus. You can output your creation as a HD DVD, DVD, VCD (Video Compact Disc), or SVCD (Super Video CD). You can import DVD video or DVD-VR files from a disc or hard drive or capture video from various sources such as a camcorder, VCR, or TV tuner. Note that digital video capture from a camcorder is via 1394 Firewire but analog video capture requires a capture card. DVD MovieFactory Launcher is the main starting point or control panel for pointing you in the proper direction for whatever disc editing and authoring task you plan to do. Below is what it looks like. Although the Launcher is helpful it does not convey enough information to preclude reading the manual. For example I decided I wanted to make a copy of a DVD which contained DivX files. Knowing that DivX files are considered data I selected "Data Disc" in the left side column of the Launcher. One of the right side choices then became "DivX Disc." The "I" (Information) description near the Launcher bottom said "Add DivX files & subtitle files to a CD, DVD or BD disc." Sounded good so I selected "DivX Disc" and was immediately transported to the Burn.Now program which opened with a screen for choosing the files. After selecting the files to burn I clicked the Burn button and was told the program could not perform the selected task. Problem was since I only have one DVD drive I could not select files from a disc in the drive and then burn those files to a blank disc in the same drive. Burn.Now was looking for the source files to be on my hard drive. It might have worked if I had two drives. My mistake was not selecting the proper item on the Launcher's left side. Once I selected "Copy Disc" I was taken to a completely different window where the process flow was to first burn an image copy to my hard drive and from that to the destination disc. One thing I like about Burn.Now is it gives you the option to verify that there are no errors on the burned disc. The verification adds additional time to the burn process but in my opinion is worth the assurance that you have a good copy. Burn.Now also allows for manual selection of the burn speed which may be helpful if one is getting errors burning at a faster speed. While on the subject of the DivX format I should mention that DVD MovieFactory does not provide for the editing of DivX files. I confirmed this by a note on page 30 of the Burn.Now User Guide which states "When creating a DivX disc, file conversion and editing are not available." So with DivX one is left with only burning existing DivX files to a disc. To me this was a disappointment as DivX is a popular video format. It took me a while to figure out exactly what was meant by creating a DivX disc in Burn.Now. The obvious was that the disc title was DivX plus the current date. For example, a disc created on August 1, 2007 would be named "DivX070801." Note that this is just a default title which can be renamed. The program also limits the files that can be placed on the disc to only those in the DivX format. It will reject any other format. So if you wanted to create a disc with a mix of MP3, DivX, and Doc files you would initially have to select to create a data disc. In that case the default title based on the above example would be "DATA070801." In addition to the Burn.Now program's burning capabilities it has some unique features such as audio conversion, volume leveling, vocal reduction, clicks removal, and hiss reduction. I tried the different effects on some audio files and depending upon the source file the output results vary. Sometimes they help and other times I did not hear a noticeable difference. The vocal reduction effect does just as it's name implies, "reduce the vocal level" but it does not completely eliminate it. This might be helpful if you are trying to do karaoke. However, if you are thinking you can turn your songs with vocals into instrumentals, this is not the case. Increasing the effect too much makes it sound like the music is playing in a large cavernous room. One can vary the sensitivity settings for the effects by first applying the effect to the selected song and then right-clicking the song. This opens a context menu where you can adjust how much of the effect you desire. I found this out by just playing with the program as the manual made no mention of how to get to the adjustment window. I guess they left some features for discovery by the individual. There is no question that this program is loaded with features. Burn.Now's audio conversion worked very well. One can convert between any of the following formats: Wav, Au, MP3, MPA (MPEG audio), OGG (Ogg Vorbis Audio), and WMA (Windows Media Audio). Since we are talking audio, have you noticed that if you open a commercial audio CD in Windows Explorer and look at the files you see Track01.cda, Track02.cda, etc. with the file type shown as CD Audio Track and a size of 1KB for each file? The extension CDA stands for Compact Disc Audio but did you ever wonder about the file size? Actually what you are looking at is a pointer to the location of the actual music data on the CD. Out of curiosity to see what selecting various parameters would do to file sizes I took a commercial audio CD and converted (with Burn.Now) one of it's CDA tracks ( the song "All of Me" which was 3 minutes and 32 seconds long) to the Wav format. This resulted in a file size of 33.9 MB. I then decided to convert the 33.9 MB Wav file to MP3 format. The program gave me several options: "Better than CD Quality" (192 Kbps, 44.1 KHz, stereo), "CD Quality" (128 Kbps, 44.1 KHz, stereo), "FM Radio Quality" (64 Kbps, 22 KHz, stereo), or "User Defined" compression which allowed one to select the Audio Mode (stereo, joint stereo, or mono), Audio Frequency, and Audio Bit Rate. The conversion resulted in the following file sizes: 4.60 MB for Better than CD Quality, 3.06 MB for CD Quality, and 1.53 MB for FM Radio Quality. This holds true to the "rule of thumb" that standard MP3 songs at CD quality are compressed at a ratio of roughly 10 to 1. That is why when burning MP3 audio CDs you can usually fit around 200 MP3 songs on a CD-ROM. The Burn.Now program, among it's many capabilities, is a comprehensive disc burning program whereas the QuickDrop program is, as the name implies, a "burn as fast as possible" program. QuickDrop when loaded on the DeskTop takes up very little space. Below you can compare the size of QuickDrop to the DeskTop icons for DVD MovieFactory and QuickTime. You have the option of leaving it loaded all of the time or loading it only when needed. To test QuickDrop I took 3 large data folders and dropped them on to the QuickDrop program image on my DeskTop. The program told me I had exceeded the disc limit. That's when I realized I needed to change the output by clicking on the Data Disc button which is not readily apparent. Again, the program is easy to use only if one first reads the manual (or happens to mouse over what looks like a text page image and realizes that it is a button). Once I switched the output from DVD Video to Data all went well. I clicked the Burn button and an animated glowing (burning) circle appeared showing the percent burned. There was no option to set the burn speed, close the disc, or verify the data on the burned disc. From what I could tell the program automatically burns at the fastest possible speed. Ulead has some informative tutorials on their programs at their web site. 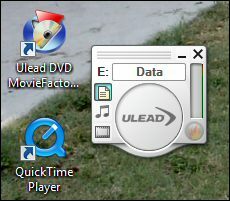 You can learn more about QuickDrop in the tutorial "How to use QuickDrop to create data/audio/video CDs and DVDs" at http://www.ulead.com/learning/dmf/dmf5_01_1.htm. Next time I'll get into using the DVD MovieFactory host program for importing video, doing video editing, and creating a DVD complete with a professional looking Hollywood-style motion effects menu.